Benazir Bhutto was born in Karachi, Pakistan, on June 21, 1953, the first of four children of Zulfikar Ali Bhutto and Nusrat Bhutto. Benazir's parents were often away from home during her childhood on business related to her father's different jobs within the Pakistani government. Although the Bhutto family followed the Muslim religion, Benazir attended Catholic schools. She was also tutored at home in nonreligious subjects, the Muslim faith, and Arabic. 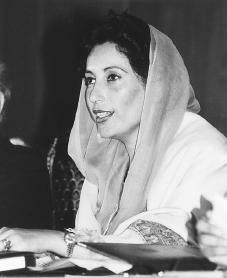 Benazir Bhutto went to the United States when she was sixteen and attended Radcliffe College in Cambridge, Massachusetts, where she earned a degree in government. At this time she experienced quite a different culture from her Pakistani home. While she was at Cambridge, her father became prime minister of Pakistan. Between 1973 and 1977 Bhutto attended Oxford University in Oxford, England. In December 1976 she was elected president of Oxford Union, becoming the first Asian woman to head that famous debating society. In 1977 Zulfikar Bhutto was arrested and his government was taken over by General Zia ul-Haq (1924–1988), who declared martial law (the exercise of control by military officials over an area). Although many questioned the verdict, Benazir Bhutto's father was found guilty of plotting to kill a political opponent and was hanged in 1979. Bhutto decided to work to restore democracy to her country, although she and her mother were often arrested. She traveled widely, criticizing the Zia government for its violations of civil and human rights. Bhutto urged her supporters to avoid violence, preferring to gain power through the political process. Martial law ended in December 1985, but the government that Zia, as president and army chief of staff, had installed did not allow free elections. Hoping to revive the campaign for representative government, Bhutto returned to Pakistan in April 1986. She traveled across the country and attracted large crowds of supporters. Bhutto also married Asif Ali Zardari in December 1987. The son of a politically active and wealthy family, Zardari's background was similar to that of his wife—not surprising since it was a traditional arranged marriage. They had two children. After Zia died suddenly in August 1988, Bhutto led the People's Party to victory in elections held in November and became prime minister. It was difficult for her to make the kinds of changes she wanted, however. For example, she was unable to change laws that degraded women because she feared losing the support of religious groups, many of whom believed it was "un-Islamic" for a woman to be the head of government in the first place. She also had to be careful in dealing with the military, which she depended on to help control ethnic and regional disorders and violence in Pakistan. Bhutto also had little success in improving education and health care and in cleaning up government corruption (unlawful conduct). To her credit Bhutto took steps to restore basic human rights. Restrictions on the press were lifted, and unions and student groups were allowed to gather freely. She also won respect by outsmarting her opponents in their attempts to oust her from office. Bhutto emphasized economic growth (increase in the production, distribution, and use of goods and services) and argued for less government influence in the economy. She also demonstrated skill in winning international support for Pakistan and sought improved relations with India. In August 1990 President Ghulam Ishaq Khah, supported by the Pakistan military, dismissed Bhutto from office, claiming that her rule had been corrupt and had abused its power. Her husband was also arrested on several charges, including kidnapping. In elections soon afterward, Bhutto's party suffered a major defeat. Nawaz Sharif, a conservative (one who prefers to keep things as they are) businessman, was named prime minister. Bhutto vowed to return to office and spent the next few years trying to regain support. She was again elected as prime minister of Pakistan in October 1993.
had chosen for president. After failing to regain power in elections held in February 1997, she claimed that the elections were fixed and said she no longer desired the prime minister's post. In April 1999 Bhutto was sentenced to five years in jail, banned from politics for five years, and fined $8.6 million on charges of corruption during her last term in office. Her husband received the same sentence. Bhutto maintained her innocence, and in April 2001 the Pakistani Supreme Court ordered new trials for both her and her husband. Despite the fact that Bhutto remained in exile from Pakistan, in autumn 2001 she traveled to India to campaign for a return to politics in her home country. At the time she planned to enter the race for prime minister of Pakistan in the October 2002 elections. In spring 2002, Pakistani President Pervez Musharraf (1943–) stated that Benazir Bhutto would not be allowed to become a candidate in the elections. Bhutto continues to claim that she is innocent of corruption charges and remains involved in the politics of Pakistan as the leader of a Pakistani political group. Bhutto, Benazir. Daughter of Destiny: An Autobiography. New York: Simon and Schuster, 1989. Hughes, Libby. Benazir Bhutto: From Prison to Prime Minister. Minneapolis: Dillon Press, 1990.
i think that the women didnot have to be killed and that she should be alive and that she also needs to help us a many as she can so we dont have to be scared. My heart feels as if it is breaking. Her bravery in raising her voice was a light to others to live with a purpose. Now who will speak for those who are not so strong? That any group would lay proud claim to such an act of cowardice boogles the mind. I pray that where one was silenced that hundreds take her place and find their resolute force for justice in God's name.